Fred Artis brings local history to life. 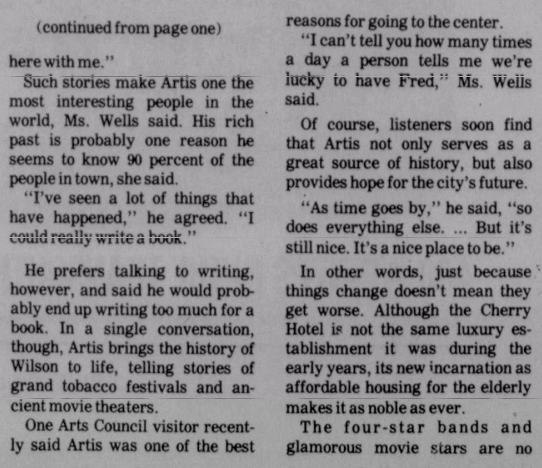 Wilson Daily Times, 15 June 1992. On 9 October 1912, Fred Artis, 23, married Mattie Lewis, 18, in Wilson. A.M.E. Zion minister B.P. Coward performed the ceremony in the presence of Alonzo Phillips, Samuel Mercer and Tobe Beland. In the 1920 census of Fountain township, Pitt County: Fred Artis, 33; wife Mattie, 23; and children Christine, 5, and Fred, 4. Mattie Artis died 2 December 1927 in Wilson. Per her death certificate, she was 32 years old; was born in Edgecombe County to Frank Lewis and Clarrisa Joyner; married to Fred Artis; and resided at 1013 Stantonsburg Street. In the 1930 census of Wilson, Wilson County: at 101 Reid Street, school janitor Fred Artist, 56, widower; children Christine, 16, Fred, 14, and Mildred, 11; and lodger Luddie Brown, 22, private cook. Fred Artis [Sr.] died 12 May 1936 in Wilson. 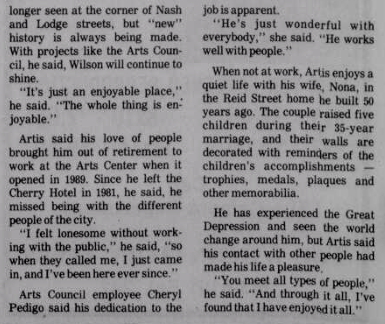 Per his death certificate, he was 38 years old; was born in Wilson County to Edward Artis and Addie Artis; was married to Annie Artis; lived at 101 Reid Street. Fred Artis Jr. was informant. 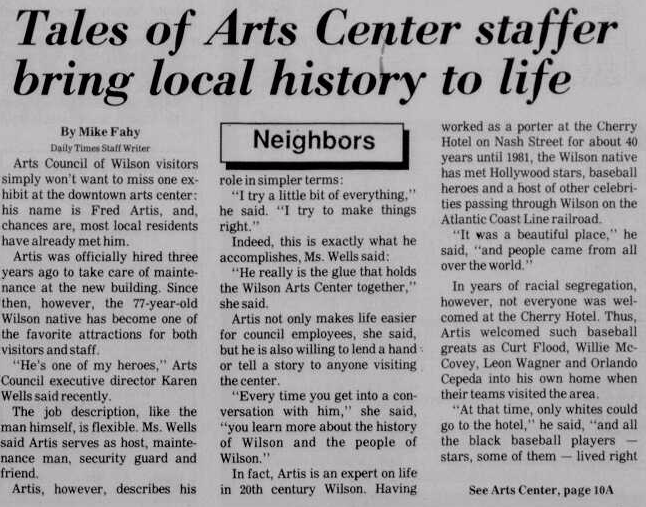 In 1940, Fred Artis Jr. registered for the World War II draft in Wilson. Per his registration card, he was born 17 March 1916 in Wilson; resided at 101 North Reid Street; his contact was mother Annie Artis; and he was unemployed. Betty Ann Artis died 4 December 1960 in Wilson at her home at 501-A Hadley Street. Per her death certificate, she was born 9 September 1925 in Wilson County to Ben Guest and Fannie Harris; and was married to Fred Artis. Nona Braswell Artis died 17 September 1996. 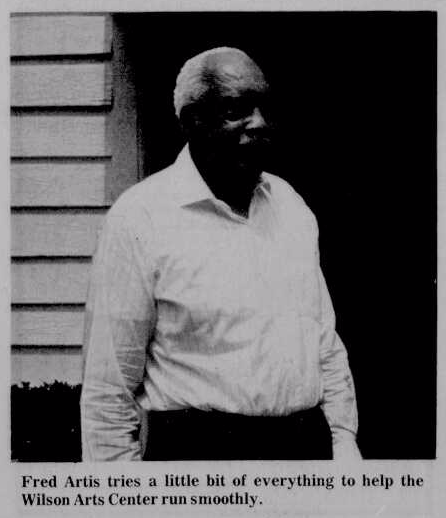 Fred Artis Jr. died 18 September 2000 in Wilson. ← Ambrose Floyd buys a piano.